Paramount Pictures descended upon San Diego Comic-Con today to present their upcoming reboot Teenage Mutant Ninja Turtles to the Hall H crowd before it hits theaters on August 8. While it remains to be seen how well this live-action adventure fares at the box office, a sequel very well could be on the horizon and, according to producer Brad Fuller, they plan on bringing in some familiar faces who aren't seen in Teenage Mutant Ninja Turtles. While April O'Neil (Megan Fox), Vern Fenwick (Will Arnett) and Shredder (William Fichtner) are featured alongside the heroes in a half-shell, there are several other characters that fans were hoping would pop up in this live-action adventure, such as Casey Jones and villains Bebop and Rocksteady. Producer Brad Fuller revealed that, if a sequel moves forward, they hope to put all of them in the follow-up. "We're just finishing the movie but we all wish that we could put everything into the movie. We all have other characters that we wish we could have had in this movie. Casey Jones. Bebop and Rocksteady. We had those conversations throughout development of this movie but we're launching this movie now in two weeks. Hopefully everybody feels the same way we do [about it]. We love them [Bebop and Rocksteady]." For those who remember the 1990 original Teenage Mutant Ninja Turtles movie, Elias Koteas portrayed Casey Jones, but Bebop and Rocksteady were not featured in that movie, or the 2007 feature TMNT. 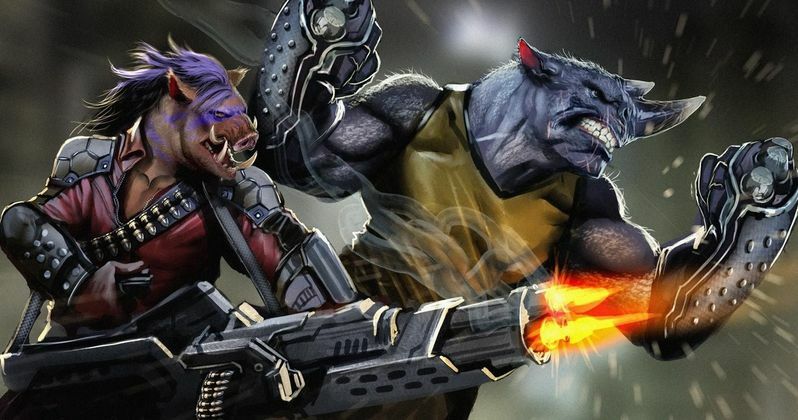 Despite being some of the most popular characters in the comics and the TV series, this sequel would mark the feature debut of both Bebop and Rocksteady. Of course, Paramount hasn't even given the green light for a sequel yet, and it's unlikely that a script is being worked on. As you may remember, the original screenplay went through a couple of writers and plenty of rewrites before it got to the state it is in today. Let's also consider the fact that Brad Fuller fails to mention Krang. Does that mean he's in the first movie that is about to open in a few weeks? Guess we'll have to wait and see.